Lately, I’ve had trouble sleeping. 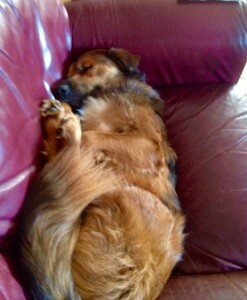 I wish I was like our dog Ben, who can sleep anytime, anyplace, in any position. Nothing bothers him. He has no regrets. Usually, when I can’t sleep it’s because I have too much on my mind. So, my go-to solution is this: I imagine my mind as a dusty attic. I climb up into it with a broom and dustpan and begin sweeping it all out – every thought, every sentence, every word, every single letter. I dig deep into the corners and sweep it all into a pile, then deposit it in a paper sack and dump it in the garbage. A clean attic is an empty, uncluttered mind. Perfect for sleeping. It doesn’t always work, of course. Last night I still couldn’t sleep after a thorough sweeping. Something nagged at me. Through a small window in the attic a moonbeam showed particles of letters floating in the air. I knew these magnetic particles would eventually form into words and thoughts. The moonbeam lit up a corner of the attic where a rolled-up rug was stashed. I lifted up the end of it and found various sentence fragments and half-words – moldy from days of old. Included were snippets of embarrassing pickup lines I once used on women in high school and college (and yes, after). Lines that did not reflect well on me and never seemed to work. I thought they were clever and funny, but in truth they were sexist and demeaning. In some cases I’m sure they were hurtful. Under the rug there were also pathetic come-on lines from other cads like myself. Lines that I knew were objectionable but let stand without a murmur (“me too” can be an indecent dude). Easy to say now, but I regret my gutless inaction in those instances. I swept up everything I found under the rug and instead of dumping it in the garbage I stuffed it all in a jar and now keep it on the mantle in a frontal part of my mind – a reminder to stand up and object when I witness harassment and abuse of women in any form. Hope I sleep better tonight, but I doubt I will. If not, it’s back to the attic.